Many times I have to work with JPEG files of product shots on a neutral (mostly white) background, that have one or more embedded clipping paths. Opening such a file in AP does show me these paths and I can clip (or blank out) the white background. So far, so good. But Affinity Photo doesn't seem to be able to save (or export) JPEGs with these clipping paths. Or at least, I can't see the logic behind it. I have a background and want to place (import) a product shot on that background. I'm choosing a JPEG with embedded clipping path. But when the image is placed, it has a white background, and I can't find an option to use the embedded clipping path, to remove the white background. The only way I found to do that, is to open the JPEG separately in AP, then chose the path (background is now transparent), select the main object by clicking on it, copy it to the clipboard go to the composite image and paste it. In Photoshop: I create a selection, refine it, click on "make work path from selection", double click it, to make it a clipping path, and save it as JPEG. The path is now embedded into the JPEG file, and when placing it within an InDesign document, I can choose the clipping path to remove the white background. But I could not find a way to save a path into JPEG with Affinity Photo. As long as Affinity Publisher is not out and hasn't proven it's capabilities, I am tied to InDesign. So I need to create and save JPEGs with clipping paths. – TIFFs, PSDs and so an are no option! 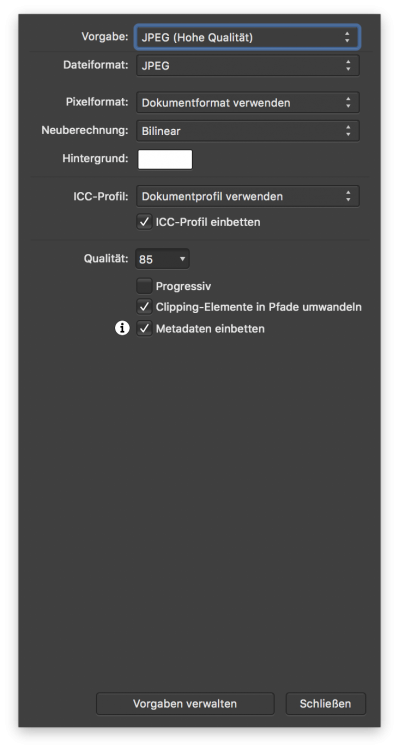 So finally the question: How exactly can I save JPEGs with embedded clipping paths, so that I can chose them in InDesign to remove the background? When exporting to JPG click the More button in the Export dialog and select/tick Convert clips to paths. I still have to test if it's working as it should in InDesign. I think that this is saved in the metadata, clipping not being part of the JPEG format itself, so you will need to have Embed Metadata checked too. Thanks for your replies! Unfortunately, that does not work. I already have checked the two options "Convert clips to paths" and also "Embed Metadata". As you can see in the first two screenshots (German version), the image has two masks. In the export dialogue I tried every possible setting, but when I check the exported file in photoshop, there is no path embedded. (See screenshot number three.) Therefore, I can not work with it in InDesign, because it always has a white background. Why not export your subjects without the background in the first place? As I said in my first post, PSD, TIFF and so on are no option. The files are way bigger than JPEGs. The latter are much easier to handle and to share. The quality is also fine, as long as they are not to much compressed. JPEG embedded clipping paths are essential for my workflow. Affinity Photo can handle them, but, as it seems, it can't write them. This should be fixed. Still would use a format that supports transparency and can be loaded into all editors. I'm often getting product shots from manufacturers. These are mostly HiRes JPEGs and it can be dozens or hundreds of photos. A folder might be 200 or 500 MB large. If I had to save all these photos to TIFF or PSD (PNG doesn't work, because it can't handle multiple clipping scenes – just one object), the same images would be 50 GB or more. This is totally inefficient and unnecessary. Also, if the JPEGs already contain a clipping path (often the case), I could use them directly to compose images in Affinity Photo, but, as described in the first post, AP can't handle the clipping path's when placing/importing a photo. This is a serious downside for me, and the reason, why I still often have to use Photoshop. Hello, this is a big problem for me too. I'm working with inDesign on a daily basis and having both png files along with jpegs is simply not practical. This is a big problem for me too.. i can't switch to Affinity Photo because of this only point. (JPEG must have clipping path inside the same file) Please let me know as soon as it will be released and you get a new client..
Clipping paths are not really part of the JPEG standard. Photoshop implements them as one of a multitude of possible Image Resource Blocks (a type of metadata) stored at the end of the file. The Path resource format section of the Adobe Photoshop file specification hints at how complex this resource can be, & even that Photoshop itself may ignore some of this metadata. So while it is possible that Affinity might someday support reading & using some of this metadata, it is not likely it will be anytime soon or that it will ever support all the path resources as well as Photoshop does. In this case, all depends on how Affinity Publisher will handle JPEG and paths from Affinity Photo. In the moment, this issue makes Affinity Photo for me unusable in 50% of my work. 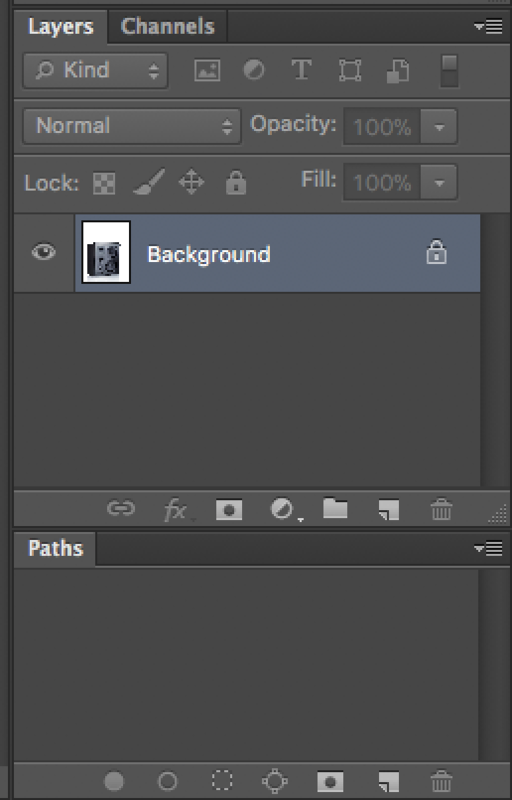 I alway have to start up Photoshop CS6 to create JPEGs with work path, that can be selected in InDesign. BTW: Are there any new life signs of Affinity Publisher? I alway have to start up Photoshop CS6 to create JPEGs with work path, that can be selected in InDesign. drag the path layer over the thumbnail of the image layer in the Layers panel (you should see a small vertical blue line appear when you drag the path layer over the thumbnail of the image layer - drop it at that point. You have nested the path to the image layer. go to File Export select JPG, set the options you want as usual, then click the More button and tick Convert clips to paths. Export the file. You will find the clipping path(s) in the Paths panel if you open the JPG in Adobe Photoshop. 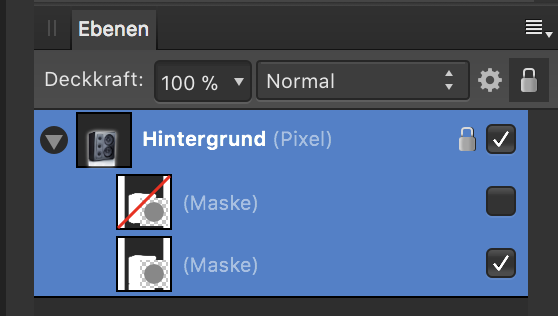 Conversely JPG's with clipping paths saved in Photoshop will open as vector masks nested to the image layer in Affinity Designer/Photo. This is possible in Affinity Designer/|Photo. For a jpeg file originally created in Photoshop, does this support or preserve all the 8 possible path records the clipping path might have, & somehow take care of the byte order difference between Windows & Mac records? I understand how the method you described works with clipping paths created in Designer or Photo, but the original question involved jpeg files that already have one or more clipping paths embedded in them, presumably by someone using Photoshop. Affinity Photo/Designer preserves multiple paths from a JPG exported from Photoshop. The only thing you currently can't do is placing the JPG file directly on canvas in Affinity apps either using the File ▸ Place command, dragging it to the canvas from Finder or using the Place image Tool (Affinity Designer only) and keep the clipping paths. If you open the JPG files directly the paths will be there as multiple clipping paths (multiple nested vector masks). You can select the main image layer (with the nested vector masks included and copy to another document if you want/need). If you have a JPG with clipping paths that are not recognised when opened (not placed) in Affinity Designer/Photo please upload it here for us to take a look.